This week's news from the cruise industry included items about Carnival Corporation, the drydock for Princess Cruises' Grand Princess, Carnival Cruise Lines, Bermuda, Royal Caribbean's Explorer of the Seas and AIDA Cruises. In today's video from the drydock from Freeport, Martyn talks with the captain of Grand Princess about his job during the drydock. Princess is also publishing a photo journal with more detailed views of the day's work. The big project for today on Grand Princess at the drydock was the removal of the first piece of Skywalkers Nightclub, the Travelator, the tube through which passengers ascended on an escalator. As you can see in the video, that part of the project wasn't completed until dusk this evening. Carnival's lovable mascot, Funship Freddy, is getting a friend. One of Carnival's iconic towel animals has grown and come to life. 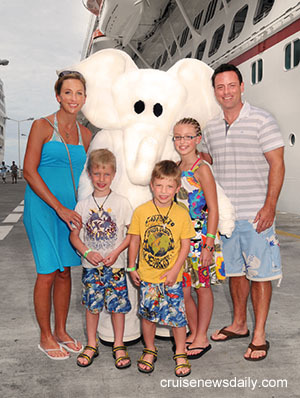 The yet-to-be-named 6-foot "towel elephant" has been seen in Camp Carnival and on the Promenade Deck of Carnival Dream for the last few weeks, meeting passengers and posing for pictures (one of the things he likes most, but don't mention laundry day). He will soon be seen aboard five more Carnival ships: Carnival Imagination, Carnival Freedom, Carnival Miracle, Carnival Sensation and Carnival Magic. On their Facebook page today, Cunard reminds us that on April 15, 1912, "while on a routine voyage from New York to Trieste Carpathia was diverted to pick up all of the survivors of Titanic and returned to New York with them." Carpathia was a member of the Cunard fleet. You read the rest of the Carpathia story in the Heritage section of the Cunard website. In today's episode from the drydock in Freeport, we get a last look at Skywalkers Nightclub before the removal process starts (tomorrow), and we get to see Grand Princess' atrium stairways taken down this morning as the conversion process goes on there to Princess' signature piazza. Princess is also publishing a photo journal with more interesting views of the work underway each day. In this episode from the Grand Bahama Shipyard in Freeport, Grand Princess' Cruise Director Martyn Moss takes viewers under the ship, sitting up on blocks, to show us parts of the vessel usually underwater. For a close up look at more of the work going on, Princess is also publishing a photo journal with its own views of the work underway that day. Princess is embarking on the most extensive transformation of a ship they've ever undertaken during the drydock of Grand Princess which started today in Freeport (Bahamas). The most dramatic change during the three-week drydock will be when Skywalkers Nightclub is removed from its perch above the ship's stern. But Princess will also be adding many new features to the ship and they will all be shown in the daily videos which will be posted here the same day they are shot in Freeport. In the first video, shot yesterday in Ft. Lauderdale, cruise director Martyn Moss shows the preparation which has already begun after the last cruise, and will continue while the ship makes the short overnight trip to Freeport. In today's second video, shot this morning in Freeport, the ship can be seen entering the drydock and being lifted out of the water. In the third video, work is beginning on the conversion of the atrium to Princess' signature piazza. But that's not all. Princess also is publishing a photo journal with its own updates of the work underway that day. AIDA's eighth ship, AIDAsol, was christened in Kiel on Saturday night (April 9, 2011). Prior to the actual naming, AIDA sponsored a free concert with some of Germany's most popular entertainers, which was attended by some 45,000 people. The highlight of the evening, was, of course when the ship was named by godmother Bettina Zwickler, followed by a massive fireworks display over the harbor. Immediately following the ceremony, AIDAsol departed on her maiden voyage.